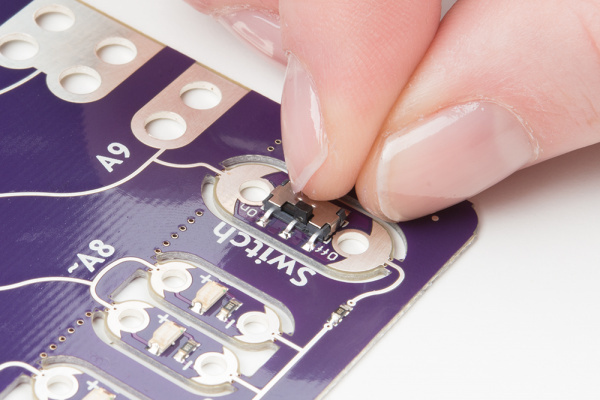 The LilyPad Temperature Sensor lets you detect temperature changes in the environment (or an object pressed against the sensor) on your wearable project. The temperature sensor board will output specific voltage at set temperatures - 10mV for every degree Celsius (°C), with 0 degrees C set at 0.5V. The current flowing through the signal tab can be read by an analog tab on a LilyPad Arduino board and converted through a formula to degrees in Celsius or Fahrenheit. Follow along to learn how to convert the voltage from the sensor into usable temperature data in your project. You will need to connect the sensor to a LilyPad Arduino or other microcontroller to read the output values and use in your code. 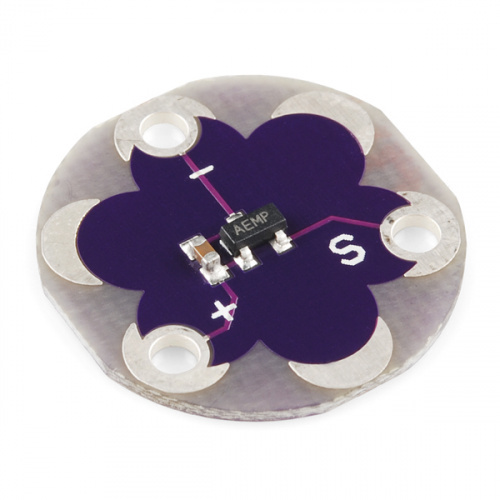 The LilyPad Temperature Sensor has three sew tabs - Power (+), Ground (-), and Signal (S). The signal tab will be connected to an analog tab (marked with an 'A') on a LilyPad Arduino. 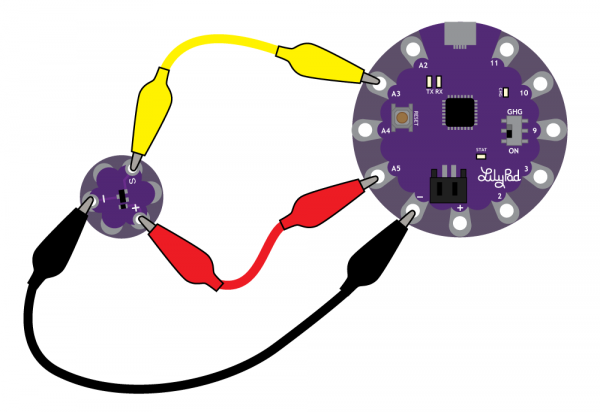 To follow along with the code examples in this tutorial, connect the temperature sensor to a LilyPad Arduino as shown below. Use alligator clips to temporarily connect Signal to A3 on a LilyPad Arduino, (-) to (-) on the LilyPad, and the (+) to (A5). When you are finished prototyping, replace the alligator clips with conductive thread traces for permanent installation in your project. If following along with a LilyPad ProtoSnap Plus, clip the temperature sensor's signal sew tab to expansion port A9. 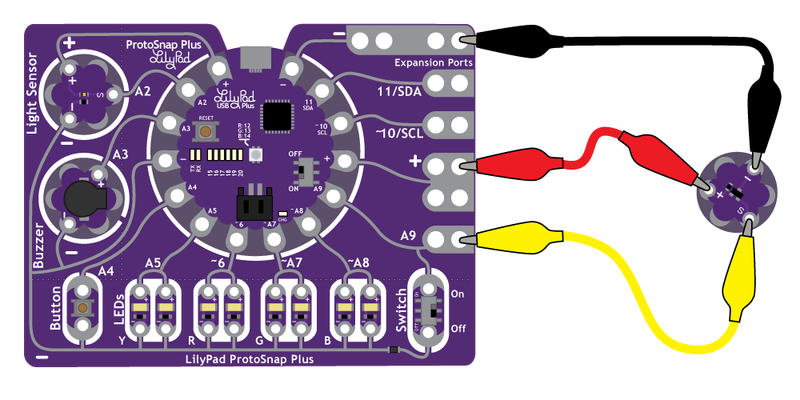 Learn more about using the expansion ports in the LilyPad ProtoSnap Plus Hookup Guide. After clipping the sensor to A9, move the slide switch to the OFF position to keep the switch from interfering with your input signal. 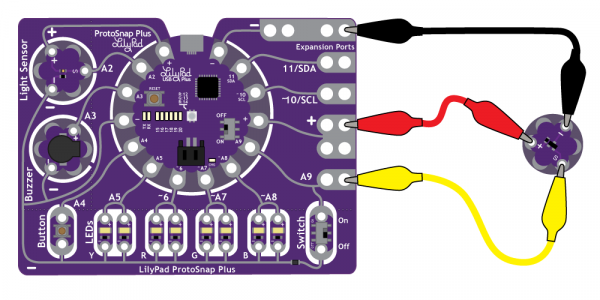 If using the ProtoSnap - LilyPad Development Simple - attach to the metal tab at the top right of the board, this connects to A3. You can also set pin A5 to HIGH in your code to use it as an additional power tab, as the LilyPad Simple's tab is hard to access in the ProtoSnap format. If using the the pre-wired temperature sensor on the ProtoSnap - LilyPad Development Board, it is attached to pin A1. Next, we'll be use Serial Monitor to read the values coming from the sensor and insert the formulas in our code to display the temperature in both Celcius and Farenheit. Note: Upload the following code to your LilyPad Arduino, making sure to select the correct LilyPad board from the drop down menu below. Choose LilyPad Arduino USB if using a LilyPad Arduino USB. The LilyPad Arduino Simple, LilyPad Arduino, and LilyPad Development Board, and Development Board Simple all use a LilyPad ATmega 328. Select LilyPad USB Plus if following along with the LilyPad ProtoSnap Plus. If prototyping with a LilyPad Development Board, change sensorPin to A1. and prints to the Serial Monitor. // Read the raw 0-1023 value of temperature into a variable. // Calculate the voltage, based on that value. // Multiply by maximum voltage (3.3V) and divide by maximum ADC value (1023). // Calculate the celsius temperature, based on that voltage..
// Use a common equation to convert celsius to Fahrenheit. F = C*9/5 + 32. After uploading the code to your LilyPad Arduino, click the magnifying glass icon at the top right of your Arduino window to open the Serial Monitor window. You should begin seeing some values from the sensor. Try placing your finger over the sensor to see the readings change. Be careful not to place anything wet on the sensor circuit when trying to get readings from cold items, it could damage the circuit. Next, we'll use some of the readings we gathered to trigger an action or behavior when the temperature is above or below a set threshold. This example uses the built-in LED attached to pin 13 on the LilyPad Arduino. on. If the temperature falls below the threshold, the LED will turn off. In this code, we use an if() statement to compare the value of threshold to the converted analog readings from the temperature sensor stored in the fahrenheit variable. If the temperature is too hot (higher than the threshold's set value), then the LED will turn on. If the value is lower than the threshold, the LED will turn off. If are having trouble getting temperatures that trigger the LED, check the output of the Serial Monitor to see if there's a better value for threshold than what is set in the example code. Need some inspiration for your next project? Check out some of the projects below from the community. 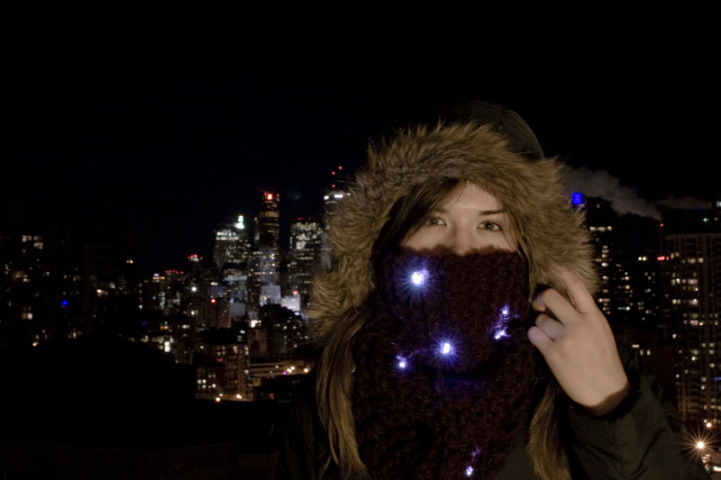 Hilary used a LilyPad Arduino, temperature sensor, conductive thread, bright white LEDs, purple wool yarn to create a scarf that illuminates with the wearer's breath. The Hands-on-Warm project uses a LilyPad Arduino, LilyPad Temperature Sensor, and heating pad to warm the hands of people who experience extreme cold sensitivity. Hands-on-Warm from Maria Julia Guimaraes on Vimeo.